Some padded dashboards with minor damage can be repaired while in the car. If this is possible with your car, you can save a lot of money. Labor costs normally associated with taking the dashboard apart will be eliminated. Another instance where vinyl dashboard repair can come in handy is if the dashboard pad does have to be removed, but has relatively minor damage. In this case there will be some cost of labor in disassembly, but you will save by repairing the old pad instead of buying a new one. 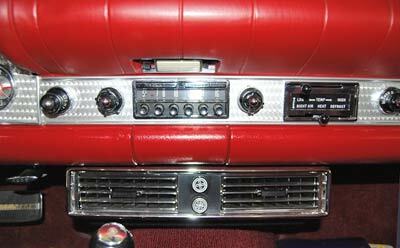 Just the minor damage can be repaired and the rest of the dash can be cleaned up and re-dyed a correct color. If you own a rare, low production car with a cracked dash pad, reproductions may not be available. In this case, repairing the original dash pad would be the only option, unless you can find a new old stock dash pad or a junkyard car with one that isn't cracked. In the real world, both of these possibilities may not come to pass and vinyl repair may be your only solution. 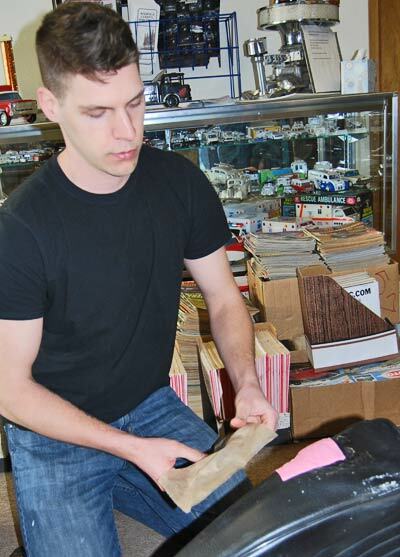 The vinyl repair process starts by searching through an inventory of grain texture papers with different grains to find the closest match to your dash pad's grain. Then, you mix up a vinyl repair compound of the proper color and make a liquid "puddle mold" that can be used to fill in the damaged area. The grain texture paper is applied over the mold and then a special 120-volt electric heating tool is used to heat the grain into the mold. You fill in the damaged spot and lay the grain texture paper out over it. The paper cures right on top of the damaged section. After it cures, you peel it off and the new vinyl matches the original grain. 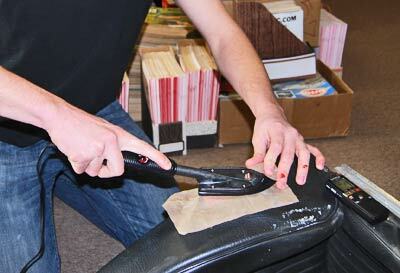 Professionals usually apply three or four coats of vinyl to make a proper repair. 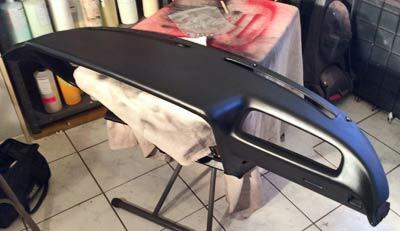 It pays to go with lighter coats so the vinyl doesn't build up and you also get a stronger repair that way. Fill in the bottom, cure that down until it holds, then go with another layer and cure that. Keep going until everything looks like it's sealed up and there are no more cracks. Padded dashboard in a 1956 Thunderbird. Introduced that year, Ford's Lifeguard Safety Equipment Package was not a very popular option. It would take over 10 years before some of the included items became mandatory. A combination of heat beating on a dash pad through a windshield and the drying out of oils in the vinyl causes cracks to develop in vinyl dashboard covers as they age. 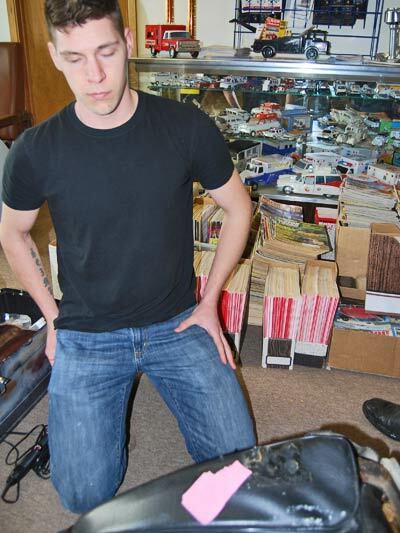 Finding NOS or good used pads is sometimes nearly impossible. 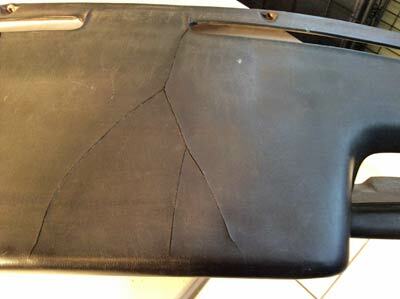 In the case of this vinyl dashboard cover, the cracks were large enough and extensive enough to require removal of the pad. 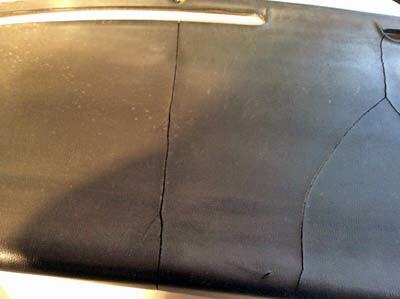 However, there are times when smaller cracks or cracks that don't go over an edge can be fixed in the car. Erik holds the Imprint Kit in his right hand and the pink grain texture paper in his left hand. 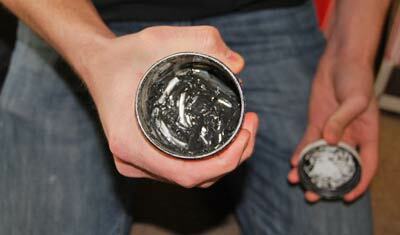 The Imprint Kit includes four containers of vinyl repair compound in different colors. This is used to make a liquid puddle mold. Erik Asplund compares the pink grain texture paper to the actual grain of the part (in this case a bucket seat) that is being repaired. 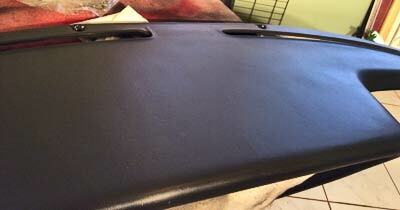 This black liquid puddle mold can be used to repair damaged areas of a black vinyl seat or a vinyl dashboard pad or cover. Erik places the grain texture paper on the black liquid puddle that has been put on seat. Erik Asplund uses a 120-volt electric heating tool that works like a miniature iron to heat up the grain texture paper that will put the correct grain into the area where the color-blended vinyl repair compound has been applied. The vinyl repair process can make the cracked dash pad look like this. It involves coloring and mixing up a liquid repair compound to fill the cracked areas, applying the proper grain texture paper over it and heating it with a special iron. Here is a close up look at the repaired section of the vinyl dashboard.